South of the Tri-Villages of Rodanthe, Waves and Salvo, past a sizeable stretch of undeveloped Cape Hatteras National Seashore, Avon, NC, is considered the largest and busiest of the Hatteras Island towns (but remember that’s relative to Hatteras Island, not where you come from). Avon has the only two stoplights on the island (and, still, it’s the busiest . . . isn’t that just perfect!). Avon was historically known as Kinnakeet, a name that is still often used to refer to the older part of town. Kinnakeet got its first post office in 1873, but 10 years later the postal service renamed it Avon, NC. In 1850 there were 318 residents of Kinnakeet, and around the turn of the century there were about 500, all of them living on the west side of the island. The area of Hatteras Island on which Avon sits was known until modern times as Kinnakeet Banks. Two life-saving stations anchored Kinnakeet Banks – Big Kinnakeet Station south of the village (about where Hatteras Realty is now) and Little Kinnakeet Station north of the village. The early Kinnakeeters, in the early 1800s, cut down large quantities of live oak and cedar trees and used them for building boats or exported them for use in building ships elsewhere. They basically stripped the island clean of trees. Kinnakeet was known for building small schooners, and in the years following the Civil War it was known for its locally built oystering fleet. Avon, NC, today is the hub for Hatteras Island. Home to the only chain grocery store (a Food Lion) as well as a popular locally owned grocery with specialty foods, Avon, NC, shopping is the big boss: surf shops, gift shops, coffee shops, spice shops, souvenirs, bike shops, fish shops, hammocks, sail shops, hardware shops, a pharmacy (!). See what we mean? The art galleries in Avon are some of the best on the Outer Banks, and the sports outfitters can get you onto the water on a SUP, exploring the estuaries in a kayak, soaring through the air on a kiteboard, gliding across the water on a windsurfer or surfing those ocean waves. Many of the shops also offer lessons. You'd expect good seafood markets, of course, but you might not expect a vape shop, yet there it is! If you just have to grab that item for a dollar, there's one of those too. But the local souvenir and gift shops are the way to experience true Avon shopping. The only match energetically to shopping in Avon is the recreation. The big kahuna of Avon, NC, things to do is surfing, whether that’s with a sail, a kite, a paddle, hanging ten or flat on your belly. South of Avon is one of the island’s most popular kiteboarding and windsurfing spots; it’s known as The Haulover or Canadian Hole. Fishing draws hoards too, whether they go for the big one from Avon Pier, offshore, in the sound or beach casting. With a local bike outfitter that will rent you a bike or fix yours if necessary and a great path that runs through Avon, biking is not only a practical way to get around but also a very enjoyable aspect of things to do in Avon. With all those art galleries comes classes and workshops too, and if you're a beader, you'll be happy with the options in Avon. Avon, NC, restaurants are plentiful and varied. Crab houses satisfy folks hungry for those tasty crustaceans, there's fine coastal cuisine, Mexican, Italian and pizzas, burgers, fresh seafood, bakeries, Chinese, delis and coffee shops with sweet treats. You can dine overlooking the sound and watch the sun set. While these restaurants are busy during the high season months of June through September, the waits usually aren't too bad, thus most don't take reservations. You might want to call ahead just to give them a heads up if you're arriving with a large party and would like to sit together. Avon restaurants are allowed to serve beer, wine and mixed drinks though all don't opt for the liquor option. Several of these restaurants serve up great breakfasts, and you can even get made-to-order doughnuts! The real focus of vacationing here is the plethora of rental houses, and that's where the vast majority of visitors stay. But there are a couple of Avon, NC, hotels and one campground. The hotels range from a resort with seven villas that offers yoga, a clubhouse and oceanfront pool, a gym and fitness classes and more to an older motel and cottage court with accommodations that offer clean and affordable places to stay. The campground is in the quiet, residential area of Avon but is still an easy walk or bike ride to the beach and shops. Because Avon is such a popular destination, Avon, NC, vacation rental companies are abundant and represent houses that range from beach boxes to oceanfront mansions. Take your pick, pony up then relax for a fabulous experience at the busiest un-busy spot on Hatteras Island. But it's recommended that you pick your place well in advance of your vacation since Avon is a popular town. Vacationers who want to experience the ease of Hatteras Island yet have the option to stay in a top-quality rental home loaded with niceties know they need to get their reservation secured months in advance. 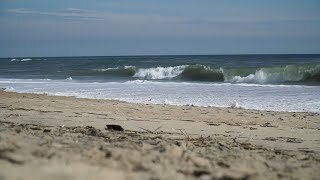 What's Avon's location on the Outer Banks? 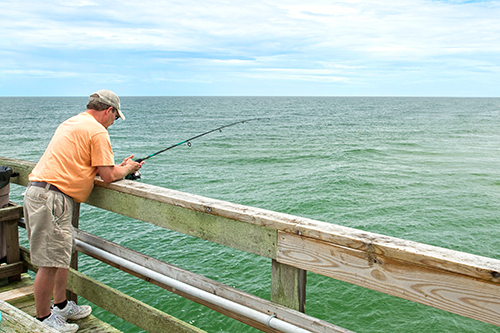 Avon, NC, is about at the halfway mark on Hatteras Island, making it a great place to base out of if you want to explore the entire island and Ocracoke (you take a free ferry to get to Ocracoke). It's south of Salvo, NC, and north of Buxton, NC, where you find the Hatteras Island Lighthouse. How long does it take to drive to other Outer Banks towns from Avon? These drive times take summer traffic into consideration. Where are the beach accesses on Hatteras Island, and are there lifeguards? The beach from Oregon Inlet to Hatteras is managed by the Cape Hatteras National Seashore, part of the National Park Service. There are two official public beach access points on Hatteras Island. The first is south of Avon and offers paved parking, bathrooms and showers. The other is south of Frisco and offers a bathhouse with bathrooms and showers. Other than those two, there are a number of Off-road Vehicle ramps (ORV) where you may walk across of – if you have a permit! – drive onto the beach. 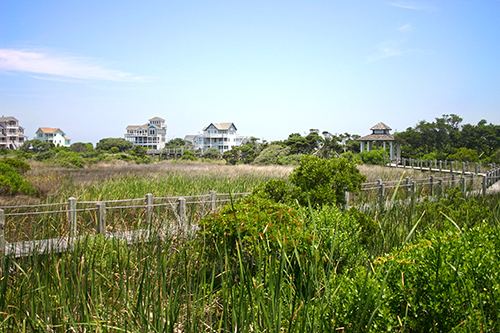 These ORV ramps dot the island from Salvo to Hatteras Village and are clearly marked. You may purchase an ORV pass at Bodie Island and at the Hatteras Island Visitor Center in Buxton and obtain a map that shows the ramps and beach areas that are currently open to drivers. Do not drive onto the beach without a permit or you will receive a hefty fine, and make sure you do not drive in a restricted area (usually marked off due to bird or turtle nestings). And, it goes without saying (we hope!) that you must have a 4WD vehicle. Your low-riding sports car will not make it! Lifeguarded beaches are found at Coquina Beach (on the northern end) and at the Hatteras Lighthouse beach in Buxton. Guards are at fixed stands from Memorial Day to Labor Day from 9 a.m. until 5 p.m.
Are we allowed to build a bonfire on Hatteras beaches? Yes, beach bonfires are allowed within the Cape Hatteras National Seashore, but you must have a permit. You can get one at the Buxton office or download a form at www.nps.gov/caha/planyourvisit/permitsandreservations.htm#Fire then sign is and mail it in. Note that bonfires must be below the high tide line. May we take our dogs on the beach on Hatteras Island? Yes! Hatteras beaches are very pet friendly, but you are asked to keep your dog on a leash that's no more than 6' long unless Fido is in the ocean. But do be aware that on summer days, the sand gets super hot, and your dog's paws can definitely get burned.